Opa’s Oktoberfest | Moat Mountain Smoke House & Brewing Co.
A German-style lager. Endearing maltiness with biscuit and toasted malt notes, medium bitterness, amber in color. 16oz. can: this one pours a clear, orange hued amber color. There was a finger or so of a beige head that didn’t linger long. Malty, but not caramel. Slightly sweet and earthy nose. The taste is good. Some malty sweetness, earthiness, some toasted malt flavors also. Not bad. 16oz. can served in a wilibecker (Thanks Rob!). Pours a copper hue with a slight haze to the clarity and rocky, half-inch, cream-colored head that slowly sizzles and pops as it dissipates into a soapy slick. Nose is malt-forward; however, not quite caramelly, and there is also a slight grassy/citrusy presence as well. Taste consistent with nose; however, the malt profile comes off a bit grainy. Not much of a caramel character and closer to skunky than sweet. Mouthfeel is light in body with an assertive carbonation and a light acidity. Overall, a bit subpar or a Marzen. Poured into a Sam Adams Octoberfest dimpled mug. Deep rich amber. Almost no head. Biscuit/wet bread smell. Toffee notes as well. Taste reflects the same. Nice mouthfeel. This beer is helping to appreciate the style. Pours deep gold-amber color - very pretty, with no head. Smells bready with some esters. Taste is slightly astringent, not very sweet for the style, and a little alcohol comes through. Not great for a brewery with much better efforts, and low value for the high price. Pint can poured into a tankard. Appearance: Pours a clear amber with a one-and-a-half-finger width cream-colored head. Decent amount of carbonation. Smell: Aroma is slightly muted. It's crisp and toasty, but doesn't have a huge malt presence in the nose. Taste: Flavors include toast, biscuit and some slightly caramel-like malts. Some floral quality as well. It's refreshing and relatively flavorful, but, like the nose, it's not in your face. Mouthfeel: A little lighter than I expected for the style. Overall: Decent marzen-type beer. Not my favorite offering from Moat, but definitely solid. 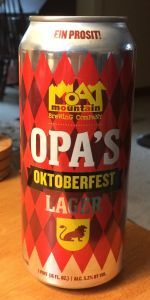 Opa’s Oktoberfest from Moat Mountain Smoke House & Brewing Co.